Croatia's coastline is on the Adriatic Sea, the part of the Mediterranean sandwiched between Italy and the former Yugoslavia. Croatia has 66 inhabited islands and much of the best diving is off these. Sea temperatures range from 7 oC in the winter to around 24 oC in summer. There can be massive differences in temperature between one area and another. Freshwater springs upwelling into the sea in some areas means the water can be pretty cold even in the summer months - take gloves and hood. 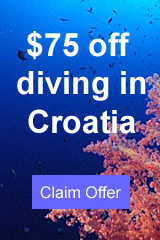 You can dive in Croatia between May and November. It is quietest in September and October and the water is still warm then. Don't forget to take diving travel insurance. Many airlines fly to Croatia - you can search for options using Skyscanner. Istra (or Istria) is a large peninsula at the far north of Croatia. "At 18m, old small sailboat,lot of marine life, stonewall from 4m up to 20m depth "
"Seahorses habitat, a lot of fish, octopus. Max depth 18-35m "
" Network of tunnels and caves throughout the island.Max depth 10-25m. " "A stunning wall dive which gave me vertigo the first time I dived it. The viz is excellent and the corals are stunning. " "This is a lovely wreck which is fully intact and upright standing in 48m. You can still see the cargo of explosives on board. " "Vrulja is an exciting dive site with a cave in 30m depth and a nice blue until purple vegetation at the wall around the cave. Even for trimix divers is that a good dive site 100m deep at the end of the canyons. Canyons are starting on 30m with a pinnacle and on 50m you can see some school of hake fishes from around 50 animals. " Podgora is a busy tourist town, one and a half hour's drive down the coast from Split. 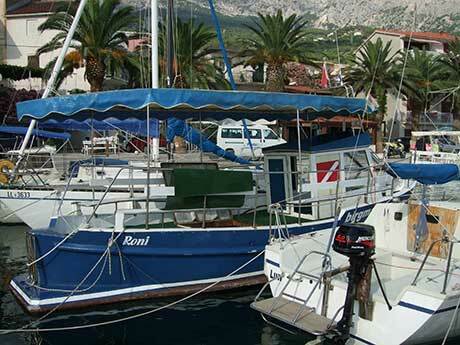 Zuc Kamen is a short boat ride away from Podgora, about 300 m off shore. The water is cold, with thermoclines at 10 and 13 m. The dive comprises two strips of rocky outcrops, one at 9 m and one at 15 m. On this dive you can see a Pinna nobilis, the rare giant mussel which is is found only in the Mediterranean Sea. This is one of the largest bivalves in the world, growing to 120 cm long. It sticks up out of the sea bed so is easily seen when diving, once you know what to look for. Fresh-water springs emerge from the sea floor on this dive - very interesting. Loads of pretty blue nudibranchs - Facelina auriculata (previously known as Facelina coronata), feather stars, octopus. Down to a sandy bed at 5 m then down a slope to a gap in rocks and a cave entrance. Further down there is a larger cave at 25 m. The cave is a resurgance (fresh water upwelling) in wet weather. After the cave you can follow the slope up and across to a series of resurgances. The water is cold and very blurry where the salt and fresh water mix. A good, if cold, dive. "Better than most places I've been to in Croatia, if not the best. " "Purple bay consists of four drop-offs, each of them a separate dive site. The rough walls with their many holes and notches are home to a wide variety of marine plants and animals, such as scorpionfish, sea fans, gold sponges and many more. If you're lucky you can even see the spotted shark there, which is very impressive with its length of approximately 1.20 m. This dive sites are very good for rebreather and nitrox diver "
"In the north of the island Hvar, right in front of a stony reef with many small caves, a long field with old amphoras stretches along depths of 12m to 28m. The amphoras belonged to a Greek ship that ran aground and lost its cargo. Now they offer shelter to many fish. The neighboring seagrass-fields on the other hand are home to many sea-slugs. " Korcula is 20 miles long and around miles wide. South from the islands of Brac and Hvar, it is quieter here. 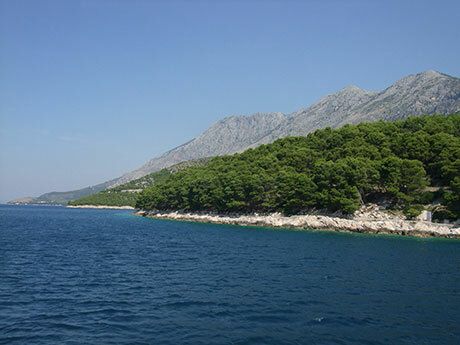 It is the sixth largest island in Croatia and lies between Split and Dubrovnik. "Tremendous wall, down to 50 meters, colourful sponges and gorgonia fans, snappers, lobsters, octopuses "
"Superb wreck dive in crystal clear Adriatic at 10-15 m. Novice to any level can enjoy this one. Lovely walls in the vicinity with fantastic colours. " The island of Vis is one of the furthest away from the Croatian mainland. Wreck of a fishing boat which sunk in 1991. Lies from 45 - 55 m at the bottom of a wall. "Wreck which left me breathless "
The anchor line is tied to the bow at 23 m. The stern lies at 50 m. An Italian transport ship in WWII, she hit a mine and sank in the Grebeni islands, close to Dubrovnik. She was carrying tractors and flour. "The ship was carrying tractors and was sunk during WW2. If I do recall well, the boat is at 45meters and the tractors are at 52meters. I did not go see the tractors, the boat was deep enough for me. " FUN DIVING Ltd is Located on Murter, an island connected by a bridge to the mainland North of Split. "Best locations in Croatia, nearby NP Kornati. Diving Courses PADI and IANTD, packages with acommodation and halfboard. Daily Diving Trips." "5 star PADI IDC center, dive course packages, hotels, apartments and 35 fantastic dive sites on Korcula island." Open from Easter until October. Dutch and English managed. "I have been diving with Pongo for the last 2 years and this is a fantastic small and friendly dive outfit. It is especially good for small groups and lone travellers. The accommodation was all inclusive courtesy of Pongo. Self catering in superb apartments overlooking the bay. There are no single supplements for lone travellers." Diving safaries throughout the Adriatic Sea, Croatian coast. Maximum 16 divers on board. Podgora is a busy tourist town on the mainland, one and a half hour's drive down the coast from Split. "Will definitely dive with them again." Tucepi is on the mainland, opposite Brac island and just up from Podgora. Motor yacht Kamelija is 27 meters long with three decks and seven cabins. German and Croatian managed. Offer apartments above the dive centre, good for families with children. Dive around Solta and the surrounding islands. A wide selection of hotels or private accommodation near the club. Boat diving on request is available. Please send us your comments on Croatia. Do you want to recommend a diving centre or dive site? Let us know. If you own a dive centre get yourself added.